Empowering Community Care Agencies To Deliver Improved Health And Economic Outcomes. The Community Care Hub gives organizations the ability to increase the coordination of care while providing recurring billable services that create sustained revenue and sustainable services — all with the goal of improving overall community health, one person at a time. Coordinate screenings for clients that pinpoint issues related to social determinants and behavioral health. Identify and prioritize client needs; automatically process resource referrals to address client needs. View individual client snapshots that surface social and healthcare-related determinants requiring attention. Generate reports that establish provider effectiveness, track results and monitor key outcomes. Get an easy-to-understand, visual view of how the Community Care Hub gives organizations the ability to increase the coordination of care while creating sustained revenue and improving overall community health. Agencies can offer new services for mental and behavioral health screenings. When done properly, both screenings and referrals can be billed to Medicare. Recurring billings can provide sustained revenue, providing opportunities for additional service offerings and improved client support. Mental and behavioral health screenings can be conducted with greater efficiency and a much higher degree of accuracy. Resources for help are automatically matched based on a client’s individual screening, and referral requests can be scheduled in a matter of seconds. 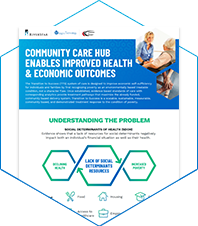 Download our White Paper and Datasheet for a more in-depth explanation of how the Community Care Hub works.